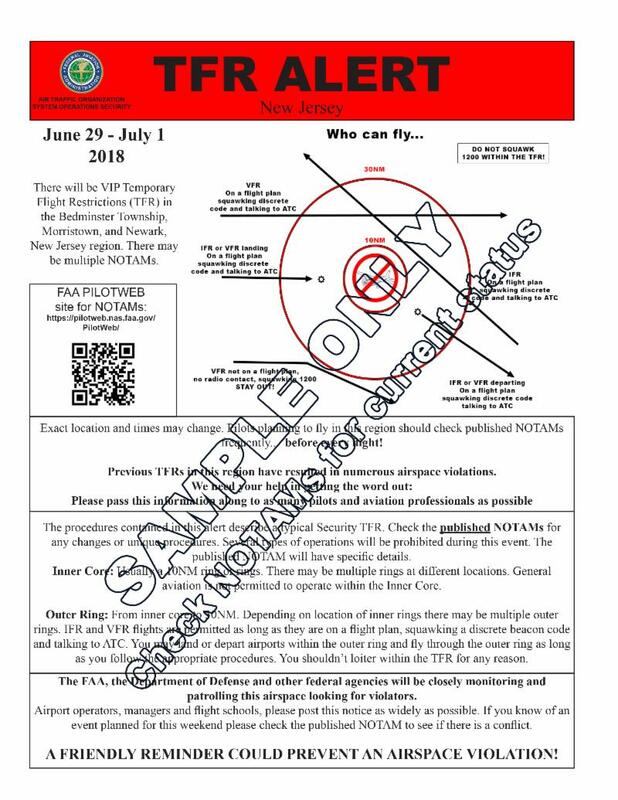 VIP Temporary Flight Restriction (TFR) effective June 29 – July 1, 2018. Follow these EASY steps to keep you in the clear. Please note that BOTH Sky Manor Airport and our business are OPEN as usual during the occasional TFR Alerts that can affect our region as we sit outside the 10nm ring surrounding Bedminster, NJ. We are, however, within the 30nm zone which does require some very simple tasks to comply with the TFR regulations. NOTE: TFRs in our region are not constant, but do happen on occasion. Please check NOTAMs for current status. Use these easy to follow steps to ensure that your flight to and from Sky Manor Air Repair is uneventful. File a VFR or IFR flight plan. If you are on the ground and a squawk code – If you are in the air, ensure you have received a squawk code prior to entering the TFR). Once handed off to Allentown Approach, they will direct you to N40. Once close by, they will switch you to N40 CTAF (122.975). Remain on the squawk code Assigned by ATC! Land, taxi to parking. Remain on assigned transponder code by ATC until shutdown. If your IFR, or your VFR, flight plan is activated, then ensure you cancel your flight plan after landing. If you did not activate your VFR flight plan, you do not have to call Allentown to advise you have landed. After start-up, call Allentown Approach on 800-728-6322, they will ask where you are departing from, etc. Allentown Approach will give you departure instructions and a squawk code. Before departure, ensure that you are squawking your assigned ATC code. After departure, contact Allentown Approach on assigned frequency as soon as practical. It’s that easy! But always ensure you remain clear of the 10nm ring surrounding the TFR. ATC has been very helpful to ensure there are no deviations. Review a Sample TFR Alert – Click Here.